Everybody knows that the northwest corner of Pennsylvania is made up of Crawford, Erie, Warren and Marion counties: The last named after the Revolutionary War hero, Francis “Swamp Fox” Marion, whose guerrilla tactics in South Carolina made him a thorn in the side of any British commander who opposed him. Whoa… Wait… Hold on there a second… Marion County? Yep. Absolutely. 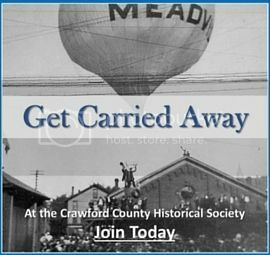 Imagine yourself in 1840’s Crawford County. You wish to record a deed, or file a lawsuit. You’re called to jury duty, or subpoenaed as a witness. Maybe want to get married or, heaven forbid, go through the disgrace of a divorce. All require travel to Meadville, the county seat. There are no railways. The roads are choking dust when dry, impassible mud when wet, and drifted with feet of snow during the cold winters. Worse, the route is crawling with highwaymen ready to rob, injure, or kill their victims. Pennsylvania law limits the travel distance to any county’s court house to a maximum of a little more than twenty miles. But that’s measured as the crow flies. It doesn’t take into account the ups-and-downs and twisty-turns of hills, or following streams to a reasonable ford. The growing population, along with newly-hatched businesses and settlements in eastern Crawford and western Warren counties loudly complain to their state representatives. Getting legal work done is a hardship. It’s slowing growth and hamstringing progress. 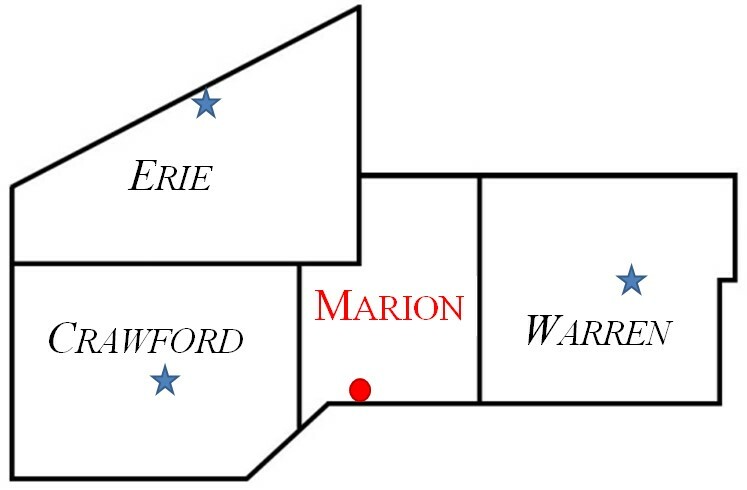 Under Bill 381, a compact, but viable county will be formed by combining Crawford’s townships of Bloomfield, Athens, Steuben, Troy, Oil Creek, Rome and Sparta with Warren’s Columbus, Spring Creek, Eldred, and South West, and Erie’s Wayne and Concord townships. 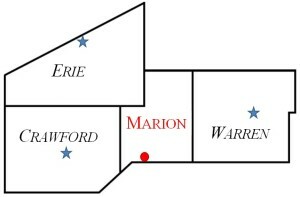 The seat of Marion County will be decided once it’s formed. It may be in a central location, like the recently incorporated Spartansburg, but realistically, the only place for it is the growing town of Titusville. Had this bill been passed a few years earlier, Pennsylvania could have simply legislated Marion County into existence. However, among other things, the 1850 rewrite of the State Constitution stripped the Commonwealth of that power. Such a change now requires majority approval in all of the impacted counties. The issue comes up in the 1858 General Election. Crawford County’s newspapers are remarkably silent on the matter. For its part, Warren County reports strong support in its western townships. There seems to be a reasonable chance for the measure to pass the county-wide referendums. As it turns out, the measure does not stand muster, especially in Warren County. Political boundaries remain unchanged. Marion County never comes to be. Citizens are forced to continue their travels for legal matters. Titusville misses this chance to have a court house. 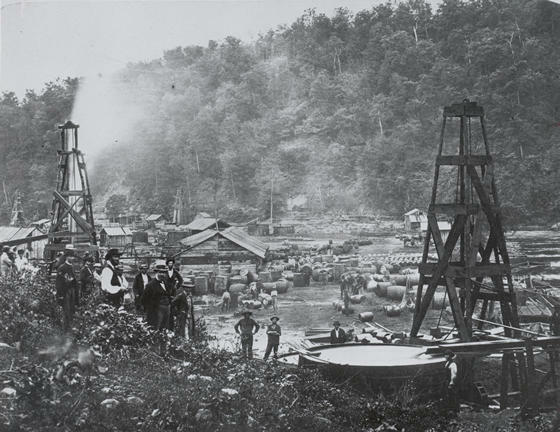 Think about it, though… In August of the very next year, 1859, driller Billy Smith finds oil in a troublesome well that crazy Edwin Drake is overseeing for the Seneca Oil Company. Had Senate Bill 381 passed, future oil production throughout its borders would have made Marion, for a while at least, one of the richest counties in Pennsylvania, if not the entire United States. As it was, all that loot was divided between Crawford, Warren, and Venango counties. The petroleum boom gave Titusville city fathers more than enough to keep them busy for the next several years. Oil also spurred the development of infrastructure, including regional railways that helped ease chronic travel problems from far-flung townships to county seats. Yet… With time, its growing economic power served to make Titusville even more discontent with the distance between it and Meadville. So much so, that a decade after the failure of Senate Bill 831, Titusville would make another and different kind of play for a bigger slice of political power in Crawford County. But that’s a story for another day. Don Hilton is the second of three sons raised in Conneaut Lake, Pennsylvania. After graduating from Conneaut Lake High School, he attended Thiel College, majoring in both Philosophy and Geology, and later earned a Master of Science in Geology from Kent State University. 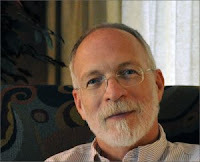 Over the course of his life, Don’s broad mix of experiences have included: passenger boat pilot, gravel pit lab technician, sweetheart, husband, post-graduate research fellow, geologist, statistician, teacher, stand-up comedian, computer support analyst, father, martial arts instructor, freelance writer, and published author. Don has published several works of local history such as Murders, Mysteries, and History of Crawford County, Pennsylvania 1800 to 1956 and Conneaut Lake Ferry Tails. More of Don’s books and writing can be found at www.dhiltonbooks.net. ____ “Journal of the Fifty-Fourth House of Representatives of the Commonwealth of Pennsylvania – Volume 1.” 02, Jan. 1844, p 196. ____ “Journal of the Senate of the Commonwealth of Pennsylvania.” 06, Oct. 1857, p 243. ____ “New County Project.” The Warren Mail. 20 Mar. 1858, p 2. ____ “The New County.” The Warren Mail. 18 Sep. 1858, p 4. ____ “County Outcome.” The McKean Citizen, 11 Nov. 1858, p 2.